This is a joint post with the hubster: Phil is the uncontested grillmeister of our household. A great time to shop for meat is right after a holiday—especially Christmas and Easter. Grocers have almost always stocked too much meat: you can usually find great deals on your favorite specialty cuts. This is especially true as the meat’s sell-by date gets closer. What I’m going to say next may seem counterintuitive, given the heading of this section. Spring for a standing rib roast. Yes, even when it’s on sale it’ll set you back anywhere from $75 to a couple hundred dollars USD. But consider this: you can cut the steaks any way you want. And if you crunch the numbers, you’ll see that your per-steak cost is much lower than if you were to buy a pre-cut individual steak. The size you buy depends on how many steaks you’d like to cut from the roast. You can buy bone-in or boneless (do you want the “cowboy ribeye” or a boneless steak?). We usually opt for boneless because they’re easier to deal with. Cut your steaks at least 1 1/2″ thick (we like 2-inch thick steaks). Any thicker and it’s more like a roast—and far more difficult to cook. We use a FoodSaver to package our steaks. After cutting the steaks, we pat them VERY dry with paper toweling before putting them in bags and sealing. It’s important to make sure that the resulting packages don’t puff up again with air (meaning that the seal is broken). Be sure to also check the meat packs about once a month to be sure that they haven’t lost their vacuum seal. 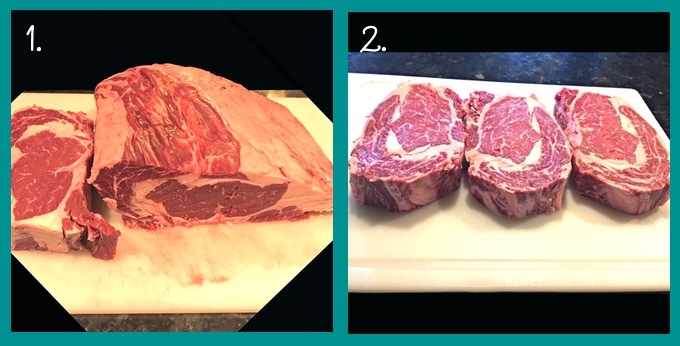 Once properly packaged, the FoodSaver blog states that you can freeze the steaks up to 3 years. We’ve never done this though: we usually eat it all up within 8 months (less if we have a cookout!). Phil enjoys the heck out of grilling and smoking meat. It’s a weekend event for him: a chance to relax, preferably with a baseball game on and an adult beverage in hand. Although he sometimes uses a gas grill (if time is tight), Phil is all about charcoal grilling. He enjoys the process of preparing and tending the coals. I have to say (in my un-expert opinion) that I think you get better flavor this way. Phil has amassed these tried-and-true tips from years and years of grilling. Some are obvious, others not so much. Use a chimney to start the coals. DON’T use self-lighting charcoal or lighter fluid. Self-lighting charcoal and lighter fluid can infuse the meat with a nasty fuel taste. This is especially true if you keep adding the lighter fluid after the fire is lit (in which case you’re lucky to escape with your eyebrows intact). For best results, rest your steak at room temperature at least 30 minutes before grilling. Wait until the coals ash over (see photo #2 below) before adding meat to the grill. If you don’t, you risk ruining your steak with the bitter flavor of creosote. When the coals are fully ashed over, load them on half the grill so you can cook the meat via indirect heat after searing. Clean the grates well with a wire brush before adding meat and while the coals are screaming hot. Control your heat with airflow: more air will give you hotter coals. Every grill is different, so experiment with the degree of “vent openness” that gives you the results you want from your grill. Use tongs to flip your steak: never use a fork. Piercing the meat will release precious juices, and you want to keep every bit so that your steak is flavorful and doesn’t dry out. ALWAYS REST THE MEAT BEFORE YOU SLICE. Steak needs at least 10 minutes to rest in order for the juices to redistribute. If you cut into the steak right away, the juices will run out onto your cutting board—and a lot of flavor along with them. How do I know when my grilled ribeye steak is done? it has about the same “give” as when you poke yourself in the hollow (fleshy part) of your cheek, the steak is approximately rare to medium rare. There should be very little resistance. A years-long debate has been raging about how long it takes to caramelize onions. I am not going to wade into those murky waters, given that I am not a professional chef. Let me clarify, though, what I do and do not mean by “caramelized.” I do mean deeply golden-brown. However, I don’t mean deeply golden-brown and fall-apart. The intent here is not to make onion jam, after all. I want some texture that stands up to steak. THAT takes about 25 minutes. I make the caramelized onions and mushrooms when the steak is about 5 minutes away from being done (the steak rests while the vegetables finish). For the mushrooms (I use cremini, a.k.a. baby portobellos), I trim the tip off the stem and discard. Then I make long slices across the mushroom, aiming for ~1/8″ thickness. I use a different method for prepping the onions than you might be used to. First, cut the ends off the onions. Place the onion on one of the flat, cut sides and slice in half. Peel, then cut into ~1/8″-thick slices across the short side of the onion halves (see photo #1 below). Next, heat a large skillet, preferably cast iron (don’t use a smaller pan, or the vegetables will be crowded and won’t brown properly) until it’s very hot, then reduce the heat to medium-high. Saute the onions and mushrooms in butter over medium-high heat. Stir frequently until golden brown, 15–20 minutes. Then, add Maggi seasoning sauce (about 1/2 tsp) and freshly ground black pepper. 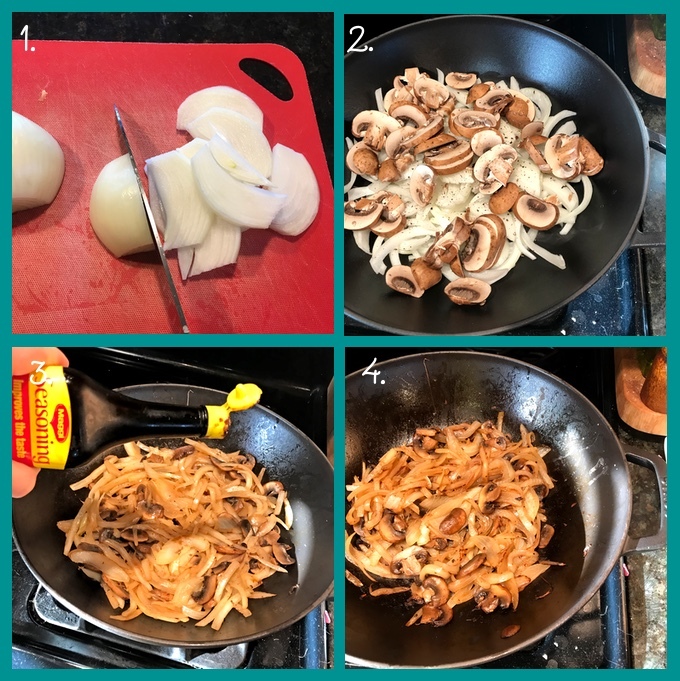 4. continue sauteing for 3–5 more minutes, or until the onions and mushrooms are deeply golden-brown (but not mushy). You can see from the photos that, while the onions and mushrooms are gorgeously golden-brown, they also still have some texture. That’s exactly what we want. 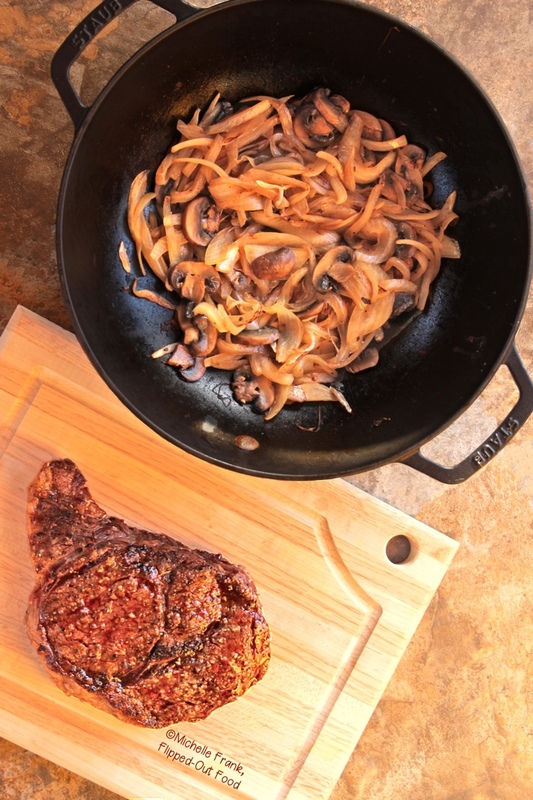 If you use a cast-iron skillet, you can prepare the caramelized onions and mushrooms on the stovetop—or on the residual heat from the grill. The latter is ideal during the hot summer if you’d rather not heat up your kitchen. As with so many fun/delicious things in life, filling up on red meat is not healthy. Everything in moderation! A 2-inch thick ribeye steak weighs in at a pound of meat or more. 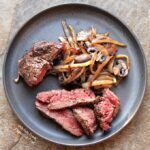 With the mushrooms and onions, this grilled ribeye steak is more than enough for 2 people—especially if you eat it with a green vegetable or salad (for example, my Arugula-Shaved-Fennel Salad). In fact, the American Heart Association recommends even smaller serving sizes (we’ve split a steak like this three ways with a couple of healthy side dishes). They say never to trust a skinny chef, but I disagree. We absolutely love the food we make. Using the strategy above helps keep us slim and healthy (along with making sure that we use up more calories than we take in [exercise! downer! ]; more about that here) . That’s it! I hope you love these steaks as much as we do. 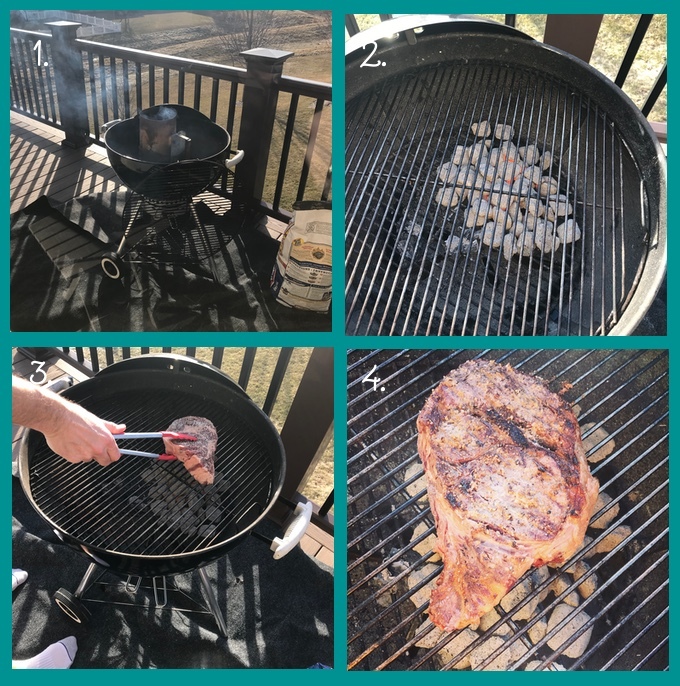 If you need more grilling ideas, check out my Carne Asada with Fajita Vegetables and Grilled Tri-Tip Steak with Chimichurri Sauce! Pat the steak dry thoroughly with paper toweling. Cover with plastic wrap and rest at room temperature for 30 minutes. Liberally salt and pepper both sides of the steak right before grilling. Meanwhile, prepare your charcoal grill. Light the coals using a chimney starter. When the coals are thoroughly ashed over, dump them into the kettle of your grill on one side for indirect heating. Place the grate on top and clean well. Place the steak directly over the hot coals. Grill for 1–3 minutes, until the steak develops a nice sear. Flip and repeat on the other side. Move the steak to the indirect side of the grill (but still close to the coals). Grill, flipping once, until done to your liking (see Recipe Notes #3–4). When the steak is approximately 5 minutes away from being done, heat a cast-iron skillet over high heat on the stovetop. When the skillet is hot, reduce the heat to medium-high and add the butter. When the butter is melted, tilt the pan to spread the butter and olive oil all around the skillet. Add the onions and mushrooms. Saute, stirring frequently, until the vegetables are softening and turning a light, golden-brown color. Remove the steak from the grill when it reaches your desired doneness. Rest for a minimum of 10 minutes. 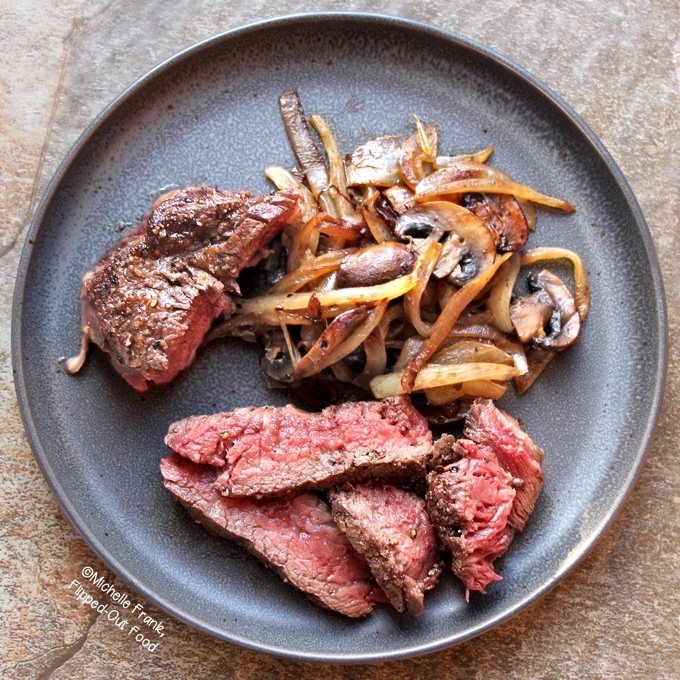 Slice the steak against its grain and serve with the mushrooms and onions. If you are following a diabetic or low-carb diet, please note that the vidalia onion does contain some carbs, so keep that in mind and adjust how much you eat if you're near your daily carb limit. If you are following a paleo, whole 30, or gluten-free diet, you can substitute coconut aminos for the Maggi seasoning sauce. If your coals are not putting out sufficient heat, you may need to finish the steak directly over the coals. Or, move to the indirect side and cover the grill. Completely open the top and bottom vent. Your forehead (firm with more resistance) = approximately well done. CHANGE LINKS TO OPEN IN NEW WINDOW!! Even after having cut down on meat I’m still partial to occasional steak as a treat and ribeye would be my cut of choice too! Just look at that marbling! Perfection! 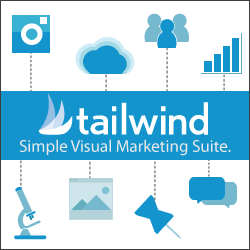 Love all the tips, super helpful! Ohh that steak looks really good. Ribeye is my favourite cut. 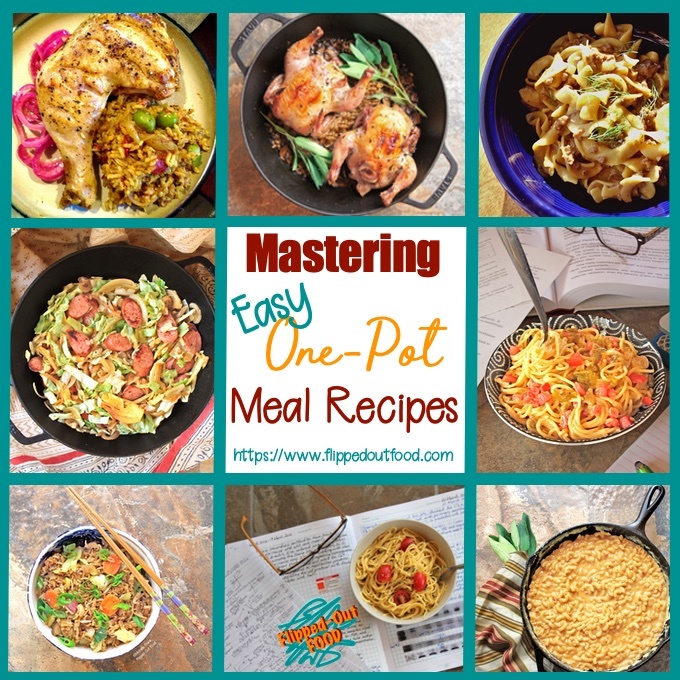 Thank you for linking to CookBlogShare.